Spa pools, which encompass hot tubs, Jacuzzis and whirlpools have become increasingly popular in the UK. 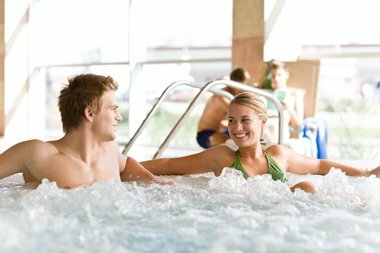 With many people installing hot tubs in their own homes, they are also a common feature in sports centres, hotels, health clubs, holiday villages and cruise ships. Providing a relaxing and pleasant experience for bathers, it is expected that as spa pools become more and more affordable, their popularity will continue to increase. However, what many people, both domestic owners of spa pools and commercial operators are not fully aware of are the potential health risks that they pose to both bathers and people nearby to the pool, if not properly managed… and this can include the risk of contracting Legionnaires’ disease from spa pools and hot tubs. One risk from using a spa pool is the risk of infection from unwanted bugs in the water. Infectious water-borne agents can be easily introduced in to a spa pool from a variety of sources, including bathers, dirt entering the pool and from the water itself. Bathers using spa pools can be at risk of infections such as E.Coli and folliculitis, and skin and other infections caused by the Pseudomonas aeruginosa bacterium. But it is legionella that poses the most serious risk, as this is the bacterium that causes Legionnaires’ disease, a severe pneumonia like illness which can in some cases prove fatal. Caused by legionella bacteria, Legionnaires’ disease is a serious lung infection that can in some instances prove to be fatal. Symptoms initially can include fever, chills and muscle pain. Once the infection reaches the lungs then chest pains, a bad cough and breathing difficulties can result. The Legionella bacteria are commonly found in natural waters, such as lakes and rivers, usually in quantities that are completely harmless. However, once Legionella bacteria enter artificial water systems such as domestic plumbing systems (taps, showers etc. ), ornamental fountains and spa pools, there can be the potential for the bacteria to multiply rapidly and contaminate the supply to dangerous concentrations. The water in spa baths is typically heated to a temperature that is perfect for the bacteria to grow and multiply. The ideal temperature range for such growth is between 20oC and 45oC. Contaminants including dead skin cells and dirt from the people using spa pools provide an excellent food for the bacteria, aiding their growth. The spa’s pipework for the water and air circulation ensures there is a large surface area for the bacteria to grow on. The fact that the water in a spa pool is often vigorously agitated (or aerated) results in aerosols and sprays containing water droplets being formed, from which the legionella bacteria can be inhaled. This should identify any potential sources of Legionella bacteria and assess how exposure could occur. A control plan is crucial to prevent or control any risks that you have identified in your risk assessment. The precautions you have put into place to manage and control the risks associated with legionella bacteria should be implemented and carefully managed. You should keep records of your risk assessment, plans and implementation which will provide an important audit trail for compliance purposes. Your staff should be trained to operate and clean the spa bath safely and effectively with reference to relevant legislation and any manufacturer’s instructions. Everyone should be made fully aware of the risks associated with the spa pools as well as the control plan in place to manage them. As experts in the risk management of Legionnaires’ disease, legionella and other water-borne pathogens such as pseudomonas and stenotrophomonas, we can help devise a comprehensive risk management programme dealing with water safety issues in healthcare, institutional and commercial facilities. Our services include risk assessments, legionella testing, control procedures and more.